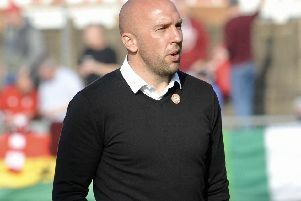 Worthing manager Adam Hinshelwood feels the first goal will be crucial in his side's local derby at Lewes this evening. Worthing go into the match in sixth place in the Bostik League Premier Division, while Lewes - who were promoted last season - sit 11th. Worthing will go up to second with all three points, while Lewes will move level on points with Worthing - and with a game in hand - if they win. On the road, Worthing are unbeaten this campaign and Hinshelwood is expecting a tough match at the Dripping Pan. He said: "Any game in this league is tough. "We'll have to have a stroke of luck and be at our level best. "It will be a tight affair, the first goal will be quite crucial but we know we have to improve on how we have been playing. "We've got to be better and improve all the time. If we can do that, we know we're a tough team to play against as well. The first 11 games or so of the season would back that up." Alex Parsons came on at half-time against Leatherhead on Saturday to return to action but Aarran Racine, Alfie Young and Ross Edwards are all still out.